PRO Cthulhu! Can be played as a solitaire game or cooperatively. Great artwork. Very simple and fast game for the Cthulhu quick bite. Fast game play, almost no setup time. CONTRA Very high random element: game can be unbeatable or a stroll in the park. Very simple mechanics without surprising elements (like special events). Not all required information are printed on the cards, which unnecessarily forces the players to refer to the rule book during a game. 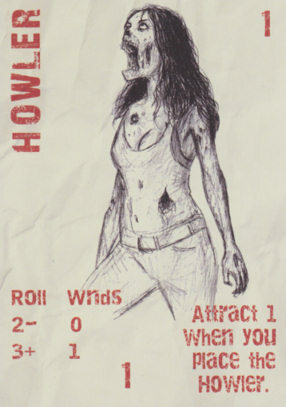 All cults have the same cultist types, which appears somewhat generic. As we already mentioned in our Hornet Leader – The Cthulhu Conflict review, we are Cultists. We are avid fans of Cthulhu and the other Great Old Ones, so we love playing games about the Cthulhu myth. It’s always interesting to see how a game approaches the topic and how it deals with the signature features of this universe: Great Old Ones, gates, minions, cultists, investigators. 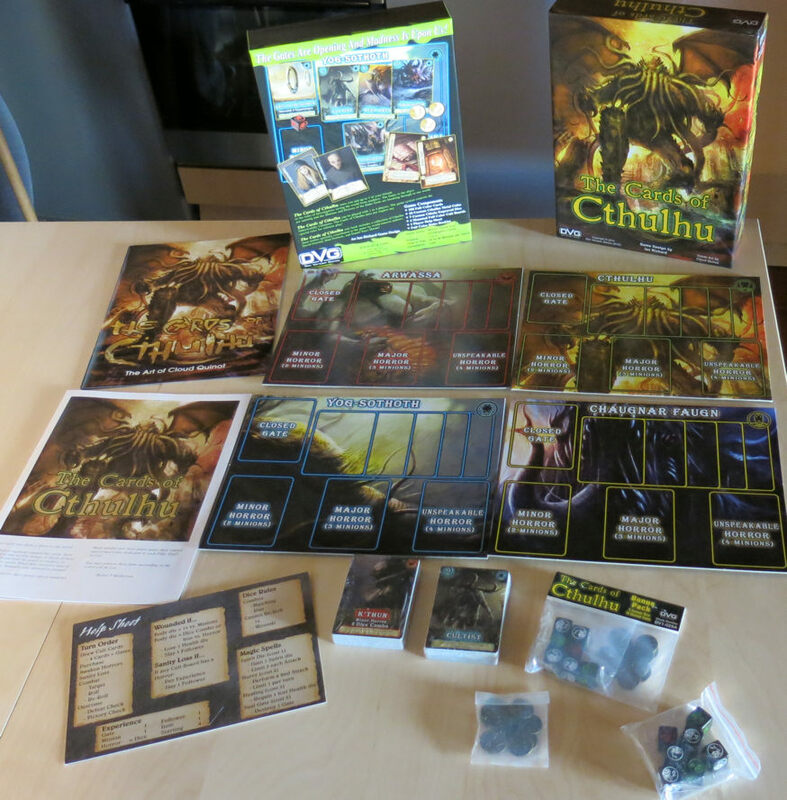 There is a vast plethora of Cthulhu games on the market, monster games like Arkham Horror, quick and fast games like Elder Sign, or the Call of Cthulhu LGC. So – when we played the new “Cards of Cthulhu” game in our HFC Test Lab, the most interesting question about “Cards of Cthulhu” was: is the game bringing any new angle or unique feature to the topic? Why do we need another Cthulhu game and what sets the game apart from the other games? Cards of Cthulhu is a quick, very simple game. It can be played as a Solitaire game as well as with 2-4 players who play the game cooperatively vs. the paper AI. Both options work without any adjustments to the rules. Each player assumes the role of an Investigator. The goal of the game is to fight 4 cults whose cultists try to awake a Great Old One by opening gates and raising minor, major and unspeakable Horrors. 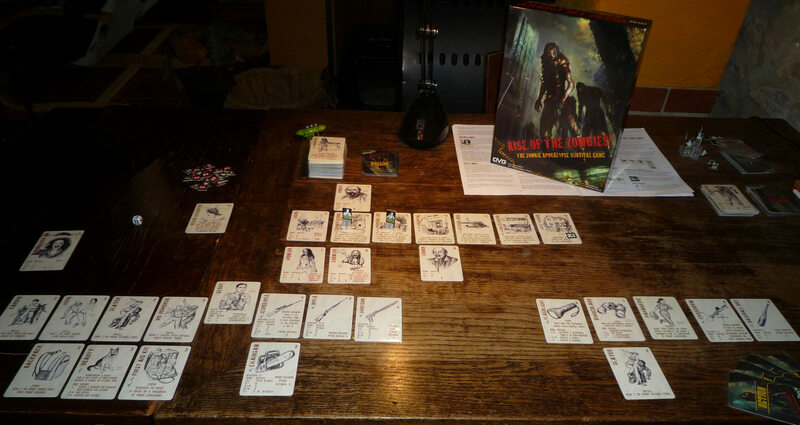 The time limit is set by the card deck; if the cultists don’t manage to overrun the world before the deck runs out, the players win. The game was designed by first-time designer Ian Richardson and published by Dan Verssen Games (DVG). It was a Kickstarter game where all stretch goals had been reached by the backers, so the game offers some nice bonus features like mounted boards and metal coins. 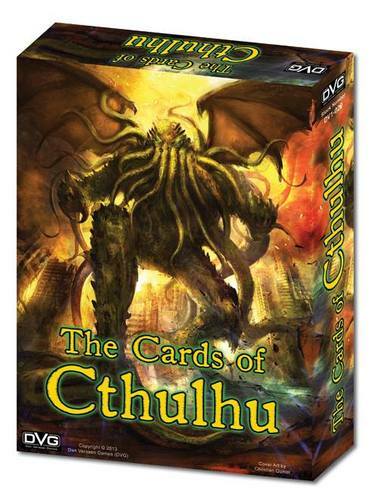 The game is shipped in a sturdy, solid box with cool Cthulhu artwork on the cover. The box contains 10 Investigator cards, among which players choose their character. The other cards are shuffled into one large deck, containing all types of playing cards like Cultists, gates, Minions, items, Followers. The cards are of a good printing quality, but appear to be somewhat thin. Since we sleeve all our card games, this wasn’t a problem at all. Generally, the illustrations on the cards are quite thematic and true to the topic. What we didn’t understand, though, was the simple fact why the Investigators and the Followers have the same illustrations. We know that each character is meant to be a “generic archetype” and not “Susan Miller, the journalist”, so that’s the explanation why each character can appear as an Investigator as well as a Follower. So you can “be” the Priest and at the same time recruit the Follower “Priest”. But to us, it would have been more atmospheric if each Investigator was a unique character with a unique picture. Playing a character and then getting the exact copy with the same illustration as a Follower simply felt awkward. In addition, there are 4 mounted cult boards, representing one cult each (the Cults of Cthulhu, Arwassa, Chaugnar Faugn, and Yog-Sothoth, respectively). During our first game, the boards warped heavily and tended to turn around on the table when we touched them, but the warping was entirely gone when we unpacked the game for the second time. Since then, the boards remained plain and didn’t warp at all anymore. There is also a Help Sheet which offers quick rules reference for the players. 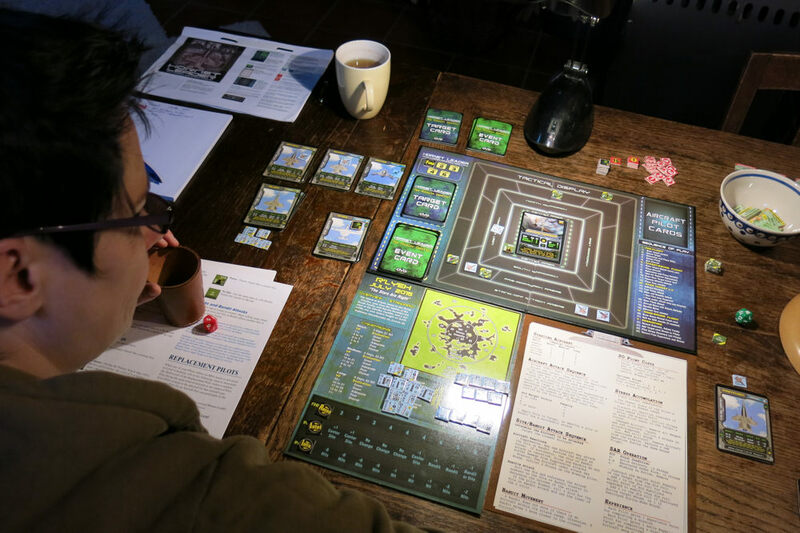 We always appreciate help sheets, regardless of how simple a game is (and Cards of Cthulhu is certainly one of the easiest Cthulhu games out there) – it serves as a rules reminder and is especially helpful when you didn’t play a game for a while and want to return it to the table without re-reading the entire rule book. The game contains three types of special dice, Health dice, Body dice, and Spirit dice. 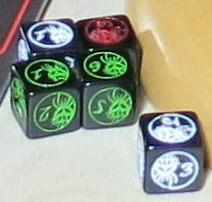 These dice are used for combat resolution. The black dice are nicely done, but one of our players had slight problems in distinguishing some of the numbers, which are printed next to a colored tentacle-shaped object. Other players didn’t have any issues at all, so this doesn’t appear to be a general problem. The currency within the game is “Experience” which is represented by golden metal coins. These were added as a Kickstarter stretching goal and we thought them to be really cool. Pure cosmetics, but much more evocative than counters. 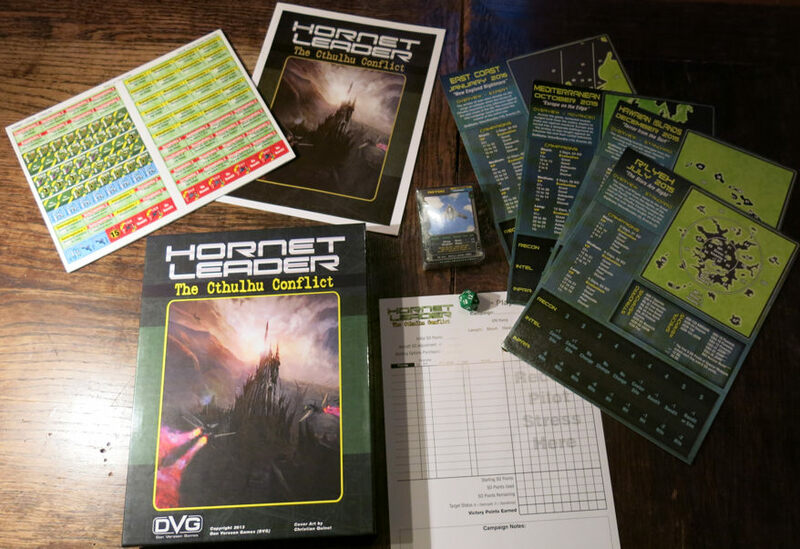 Besides the full-color rule book, the game also contains an artwork book, which illustrates the origination process of many illustrations with comments and explanations by Cloud Quinot, the artist (who also did the artworks for Hornet Leader – The Cthulhu Conflict). The overall production quality is, as usual with games published by DVG, very good. Especially the artworks are very atmospheric and true to the topic with painting-like illustrations. As in Cthulhu Conflict, the artist did a great job to convey a very special, very dark Lovecraftian atmosphere. There is also a “Cards of Cthulhu Bonus pack” available which includes 7 more Cthulhu dice and 10 more coins. This is helpful if you play the game with more players, so players won’t have to share the dice – and you can never have enough coins. But the Bonus pack doesn’t include any additional cards, or rules, it isn’t a game expansion! So whether additional dice and coins are important enough for you to buy this expansion, is a matter of personal preference (you could also share your dice among all players and use coins of your local currency).